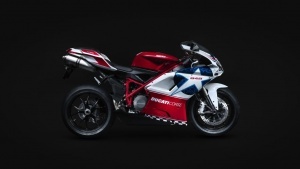 Ducati North America will unveil the 2010 Ducati 848 Nicky Hayden Special Edition at 4pm Saturday July 4th on Ducati Island at the USGP with Nicky Hayden and Ducati CEO Gabiele Torchio. The Nicky Hayden Edition 848 will be on display the rest of the race weekend. The 2010 Ducati 848 Nicky Hayden Special Edition will be available at authorized Ducati dealerships July 7th in limited numbers. The US-exclusive model priced at $14,495 is sure to sell out fast. For more information on Ducati motorcycles visit Ducati USA. Photo courtesy of Ducati, all rights reserved. Author: Dwight Domonkos /// submitted on July 4, 2009 - 9:26am. Helio Castroneves, front wheels locked up in turn 4.